Wisely, UFC fighters Rose Namajunas and Michael Chiesa want marijuana removed from banned list of substances competitors can’t use leading up to their mixed martial arts bouts. 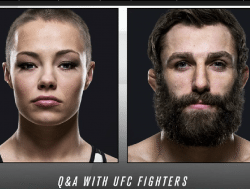 The two up-and-comers stated their positions on cannabis during a Q&A session ahead of UFC 195. Chiesa trains in Washington State while Namajunas fights out of Colorado, the first two states to legalize cannabis. Michael Chiesa currently ranks as the #14 lightweight fighter in the UFC while Rose Namajunas is currently ranked #3 in the women’s strawweight division. Chiesa is coming off of an impressive win against former title contender Jim Miller while Namajunas completely dominated Paige VanZant, the #7 ranked fighter in her division. Both fighters discuss the absurdity of the prohibition on cannabis use, especially compared to alcohol and more dangerous pharmaceuticals. The UFC’s moderator seemed to be nervous about treading on the subject of cannabis, but Chiesa and Namajunas weren’t skittish about talking about the issue at all. Rose even threw in a #FreeNickDiaz reference, as Nick Diaz has been given a ridiculous 5 year suspension for using marijuana. We are seeing more and more athletes speaking out about the need for sports to adhere to science and not politics on the issue of cannabis use, notably former UFC champion Ronda Rousey. Many world-class athletes have used cannabis, from Heisman Trophy winner Ricky Williams to Olympic legends Michael Phelps and Usain Bolt, proving that athletes can utilize cannabis and achieve their goals. Additionally, there is evidence that medical cannabis can help prevent concussions as Harvard psychiatrist Dr. Lester Grinspoon states in his open letter to NFL Commissioner Roger Goodell. Hopefully, for the sake of athletes and our society, even more professional competitors will speak out soon so we can implement a sane policy that is better for all of us, including those sacrificing their bodies for our entertainment.